WordPress already comes with a bunch of default widgets for you to use to add content to your sidebar. If you have a premium plugin or theme, chances are they come with custom widgets for your site. The default Recent Posts plugin is useful but has many limitations. With Category Posts Widget for WordPress, you can display recent posts from a single category. 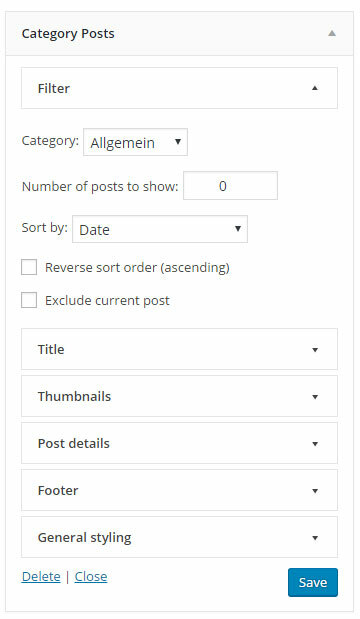 The plugin lets you change category, number of posts to show, sort order, and other settings. Users have the option to enable thumbnails, change their dimensions, show/hide post date and other info, and change footer link text and URL easily. Posts can be ordered by title, date, number of comments, or on random. You can download this plugin for free. The paid version has more complex layout and effects.